Baptized Paganism - Yah's holy alliance! The controversy over religion started with Sun-worship. In our study of "Baptized Paganism" we will begin with the Origin of Sun-worship, then trace the History of Sun-worship, and finally point out the Place of Sun-worship today. And believe it or not, Sun-worship today is not only found in Paganism, it is likewise found in Catholicism and in Pseudo-Protestantism (bearing vestiges of Babylonian paganism, is thus rendered pagan). 1. Isaiah 14:12-15; "Lucifer, the 'day star': Dictionary says "Day Star" is "the Sun." Lucifer, the 'Day Star' wanted to be worshiped, started a rebellion in heaven, (Rev. 12:7-9), cast out, came to this Earth; Adam and Even succumbed to his subtlety, (Genesis 3:22-24); They were driven from the garden, and they worshiped at the East Gate of the Garden, with backs to the Sun. Later Satan deceived people into facing the Sun, and even worshiping it as the Deity. 2. "Sun worship was the earliest idolatry." (or Nature worship) Biblical Encyclopedia, AR Fausset, page 666. "The sun was worshiped by the ante-diluvians," ppp. pg. 91. Paul says, "they worshiped and served the creature more than the Creator." (Romans 1:25). And the Flood came and took them all away. Who was Nimrod? Husband of Semiramis: a priest-king (or pontifex-Maximus), instigator of Sun Worship, founder of the original religion known as paganism and builder of the Tower of Babel. "Babel" means "confusion." Isaiah 51:7, Religion of Babylon spread to every nation. Nimrod, known as Bel-Marduk, Ra, Surya, Sol, Baal, Apollo, and many other names. How do we know the Babylonian religion was built around Sun-worship? (1.) Temples, sun carvings, sun statues (graven images), sun domes, etc. (3.) Many things dedicated to the Sun: Sun-House, Sun-Gate, Sun-Horses, Sun Chariots, Sun-Images, Sun-Worship, Sun-Day, (see Jeremiah 43:13/2-Kings 23:11/Job 31:26-28). Nimrod is called "the father of the gods." 2. ...The "Queen of Heaven." (Judges 2:13) Israel "served Baal and Ashtaroth," or Nimrod and Semiramis. "Noted for her wisdom, beauty, her voluptuousness (fertility), but particularly as the mother of Tammuz." His supposed Miraculous birth, on Dec. 25, the winter solstice. This is why we celebrate Christ-mass, an ancient pagan inheritance. What should be our attitude towards Christmas? What about the "Feast of Tammuz?" Hot cross buns (Jeremiah 7:17-18; 44:18-19). This was the religion of Babylon: the religion of Paganism. Ancient Babylon became a great empire (of "gold" according to Daniel's dream). In 538 BC. Babylon was conquered by the Medes and Persians (Cyrus the Great); today ancient Babylon remains a desolate waste (with it's crumbling "high place" of Marduk/Bel=Baal). Ancient Babylon fell as the biblical prophets predicted (Isaiah 13:19-21, Jeremiah 51:26-7). But her superstitious system of pagan religion, i.e. Sun-worship, has conquered and poisoned Christendom and the rest of the world, having survived the millenniums of time. After the fall of Babylon, the Chaldean Magi fled to Asia Minor, and history tells us that Pergamos became their religious headquarters. The Bible calls Pergamos "Satan's Seat" (Rev. 2:13). There we find the famed "Temple of Asclepius," the great "Alter of Zeus": and also the "Temple of Agustus," dedicated to the worship of the Roman emperor as "Lord & God" (priest-king/god-king) or "pontiff-king." Where did the worship of the Virgin Mary come from? Not from the Bible, but from paganism. Where did the idea of the Mass come from? Where did the Sign of the Cross come from? Not from the Bible but from paganism. Where did the Rosary come from? Where did Purgatory come from? Where did the teaching that there should be Monks and Nuns come from? Where did Infant Baptism and sprinkling come from? and the concept of an Eternal Hell; all come from? Where did Sunday observance come from? Where did the plural-deity concept of the Trinity come from? There is abundant evidence to show that all these things and many other unmentioned rites and rituals came from paganism. Rev.14:8; Yah's last warning message: This is talking about apocalyptic Babylon, i.e. Modern Babylon. Holy Writ saith, 'she' is a woman: prophetically a woman represents a church assembly (Jeremiah 6:2; Isaiah 51:16). A fallen church is following the traditions and commandments of men. Yahshua says, vain worship (Mark 7:7-9). Yahweh's call to His people everywhere (Rev.18:1-5) is to come out of mystical Babylon, to flee from it; to forsake it; to follow plain and unadulterated Bible teachings (i.e. Saving Truth; even to remove the Abomination). Cardinals, or Priests of the Hinge: The name "Cardinal" was given originally to the Pope, but now it refers only to those who assist him in opening and closing the doors of Janus. Thus the Pope's grand council of State which assists him in the government of the church came to be called the College of Cardinals. The Cross: the papal cross is the cross of paganism. It is the grand charm and the universal sign of Catholicism. No prayer can be said or religious service performed without the sign of the cross. It is used in applying the 'holy' water at the entrance of the church, again before being seated and again before turning the back on the altar to leave. None can pass the altar without the sign of the cross (pointing to each shoulder and up and down over the heart). The Pagan Cross is an outgrowth of nature (or creature) worship. It was originally the symbol of a Tree (asherah) which represented the Life and Generative principle of which the Sun was the supposed source. The tree with it's cross or lateral branches, and the branches again crossed, represented Life & Generation. The Maltese cross with the circle is a double emblem of the pagan sun-god. The cross was worshipped by the pagan Celts, and also in Mexico for ages before the Roman Catholics set foot there; archeological discoveries show the temples of Egypt, including the temple of Serapis in Alexandria, were marked with crosses; also, on Egyptian mummies. Crosses have permeated paganism for eons. The 'Sign of the Cross' was the 'mystic Tau' of the Chaldeans and Egyptians, the true original of the letter "T," the first initial of Tammuz. The mystic 'Tau' was marked in baptism on the foreheads of those initiated in the mysteries, and was used in every variety of ways as a most sacred symbol; called 'the sign of life,' used as an amulet over the heart, marked on the official garments of the priests, born by kings in their hands as a token of their supposed divinity. The vestal virgins of pagan Rome wore it suspended from their necklaces as the nuns do now. (evidently the nuns came from the pagan tradition of vestal virgins/Fraser/ed.). Christmass or Christ's Mass, 25th day of December: On this winter day was held one of the leading pagan solstice festivals in honor of the birth of the sun god. This was the birthday of Osiris, the son of Isis; it was called 'Natalis Invictae Solis,' the birthday of the unconquered Sun, it being the period of the winter solstice when the sun first begins to regain it's power. It was the birthday of the sun god Mithras (of Crete). Burning of the "Yule Log" was the (symbolic) death of the sun god (in the person of the spirit of the tree=anthropomorphic nature deity), burned on the evening of Dec. 25, ...it was supposed to reappear with rejoicing on the next day, the birthday of the Sun-god, in the form of a young tree, loaded with presents. This pagan event entered the Christian church with the act of Julius 1, who presided as pope or bishop of Rome from 337-352 AD. Luke 2:5-8; Shepherds abiding in the field, It is a historical fact that the shepherds never do this after the October rains set in. The Palestine winters are quite severe. See Matt. 24:20; The shepherds would not keep the sheep out in the open all night in this time of year. Luke 2:1-5; This tax applied to all the Roman Empire. Traveling was then difficult even under the most favorable circumstances. Because of this, the religious festivals were all held in the spring and summer. No Roman Emperor would have issued such a decree in the winter. or the beginning of September. The Confessional: Of pagan Origin; the Babylonians had to make confession to a priest before initiation into the Chaldean Mysteries. Every effort was made to frighten the worshipper into making a complete confession which gave the pagan priests complete power over them. One of the gods of Babylon was represented as having a pair of balances in his hand by which he weighed the deeds of men, to determine their destiny. nor is this from the above anonymous SDA tract. In the ancient Sumerian pantheon of nature deities, there were three major gods (or deities) who ruled their entire pantheon. The Third and not the least, was the 'powerful' "Enki," ruler of the Underworld, the Sea, and the Dead. He reigned in the waters beneath the Earth. These three pagan deities were the original "trinity" or "triune godhead" of ancient Sumer and all Mesopotamia, and the Sumerian and Mesopotamian peoples made images of these, and served these images (howsoever). "Thou shalt have no other Elohim (Heb. for "mighty ones") before Me. Thou shalt not make unto thee any graven image, or any likeness of anything that is in the heavens above, or that is in the earth beneath, or that is in the waters beneath the earth: thou shalt not bow down thyself unto them, nor serve them." 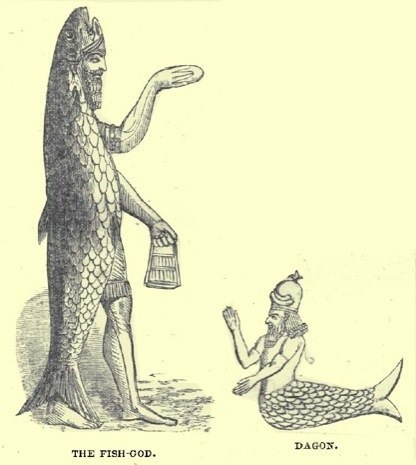 "In the waters beneath the earth" undoubtedly refers to Enki, his domain supposedly being under the earth, under Enlil's domain, in the sea, the underworld, the "waters beneath" the earth. And so this Second Commandment is singularly and specifically against the idolatry of the "triune-godhead" concept of pagan polytheistic origin, (read "the Two Babylons" by Hislop, at least in part). Because of Yahweh's Second Commandment, we must not interpret any scripture through the eye of a pagan concept of plural deities (polytheism).